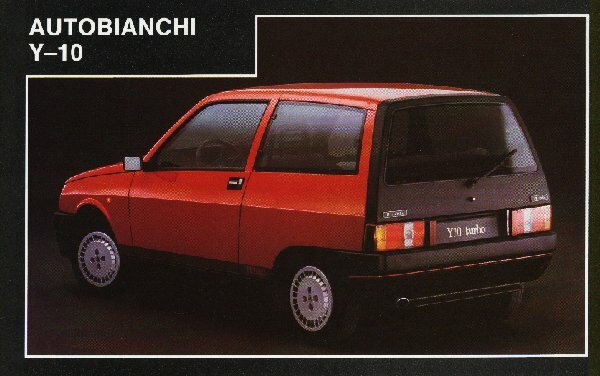 The Lancia Y10 Turbo with its 1050cc Turbo engine, was the smallest production turbocharged car in Europe when it came out in mid-1985 along with the rest of the Y10 range. The most lively of the Y10s utilised a 1049cc engine built by Fiat Brazil which could trace its ancestory back to the Fiat 127. Thanks to the fitment of a Japanese IHI turbocharger (incidentally the same as used later in the Maserati Biturbo, albeit in pairs) the top-line Y10 devours distance with an urgency that Fiat 127 owners could only dream about. The Y10 Turbo's transversely mounted front engine develops 85 bhp at 5750 rpm, just 450 rpm short of the red line, and 90 lb.ft. of torque is available at 2750 rpm. This leads to a very impressive power-to-weight ratio of 109 bhp/ton, identical to that of the Lancia Delta 1600GT and on a par with such other contemporary cars as the Opel Manta GT/E and Cavalier 1.8 SRi. Another class-topping figure, the Y10 had a Cd of only 0.31 and entered the UK market priced at £5795.